Our egg shaped ombre caves are a perfect size and shape for your cat, and some small dog breeds, to sleep, hide and play. Caves provide a safe, warm haven and can help your pet feel secure. This elegant black/white cave will suit any interior. Our ombre cave is approximately 20″ long, 14″ wide and 10″ high and is roomy for pets up to 12 lbs and cozy for those up to 16 lbs. DESCRIPTION Your pets don’t care how cute their stuff is; they like it for all the right reasons! The Himalayan wool we use for our toys and beds is not chemically cleansed, so it has a lot of lanolin in it. Lanolin is the natural oil unique to sheep’s wool and it reminds cats of the scent of their mother. Lanolin oil conditions their paws and helps to keep their fur healthy and shiny. 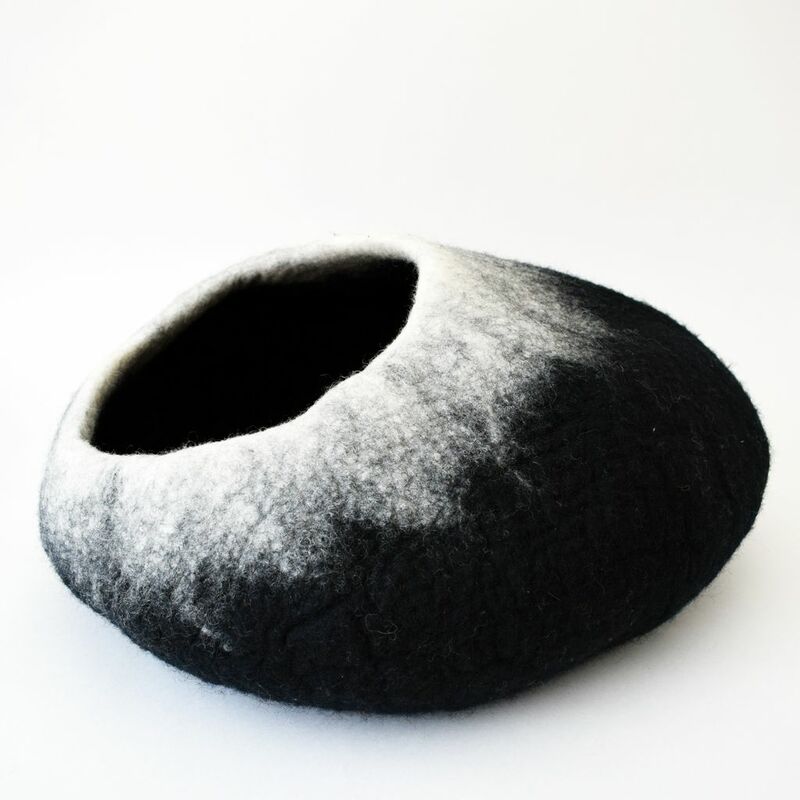 Using a technique called wet-felting, the only materials used in the making of these items are pure wool, natural soap and water. We use safe, non-toxic dyes in an environmentally sustainable low-impact dying process which uses less energy and produces less waste byproduct. Our products are handcrafted by women in Nepal; your purchase supports these artisans and their families, helps raise them out of poverty, and keeps crafting traditions alive. Care: The lanolin in the wool is anti-microbial and odor resistant which keeps our wool beds and toys naturally clean. They can be vacuumed or spot cleaned with a sponge or vacuumed. If a bed becomes very soiled, turn it inside out, and wash it in the delicate cycle of a washing machine. You will find care instructions on your purchase.